Winter can be one of the most magical times of the year. With the cool weather, the magical fairy lights wrapped around the trees and lamp posts, and the holiday joy that lingers through the air. 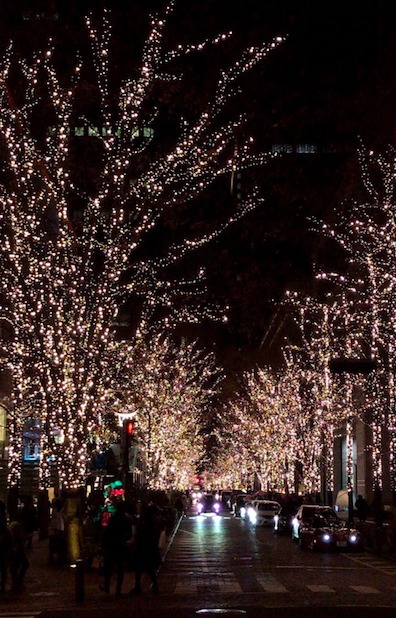 Especially in Japan, you can expect to see a lot of gorgeous lights decorating the streets and department stores, many of the shops offering Christmas-themed products like red and green sweaters or socks. 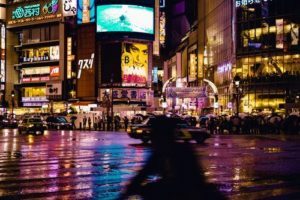 Japanese winter usually starts in December, when the temperature drops significantly until around March, where the temperature begins to pick back up by the end of the month. 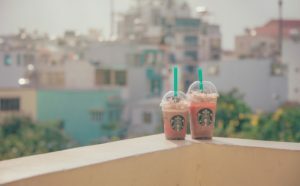 There are many winter activities partake in Japan, whether it’s sports-based like skiing or snowboarding, where you can enjoy the view of gorgeous snow-capped mountains and puffy white bundles of snow at your feet, or shopping, where most department stores are on clearance during this season. However, after all the fun winter activities, you might find yourself feeling pretty hungry from using all your energy keeping yourself warm. 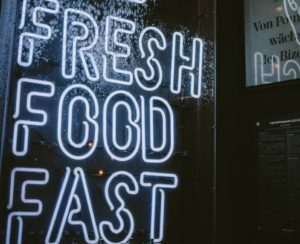 Even if you enjoy spending your winter cozying up in your room with your favorite hot cocoa, you might find yourself craving some warm and comforting food. You can fight against the freezing winter with these 5 sizzling hot Japanese dishes! Hot pot in Japan is called “nabemono” or simplified as “nabe”. In Japanese, Nabemono is written as “鍋物”, where “鍋” is pronounced as “nabe” in English and means “pot” or “pan”, while “物” is pronounced as “mono” in English and means “things”. Put together, the word basically translates into “things in a pot”, which is exactly what a hot pot is. There are many kinds of Nabe in Japan, and each nabe differs in its ingredients and way of preparing it. You can learn more about the different kinds of Japanese hot pots and recipes here and here. 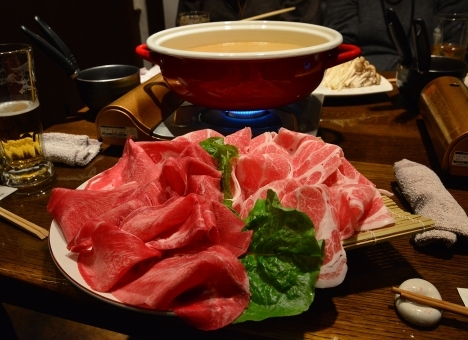 One of the most popular kinds of nabe in Japan is “shabu shabu”. “Shabu shabu” is written in Japanese as “しゃぶしゃぶ”, with its name coming from the sound of the boiling ingredients in the steaming hot soup. 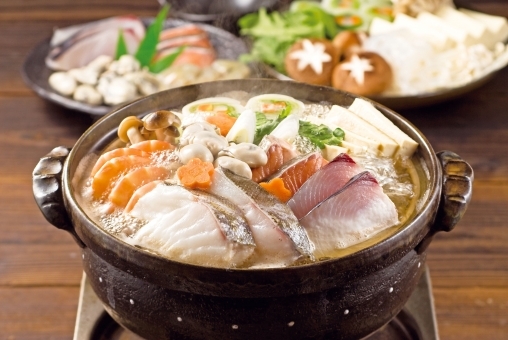 Unlike other nabe, where the pot is served with the ingredients already boiling inside, shabu pots are served with the soup and raw ingredients separated. Shabu usually consists of thin-sliced meat, glass noodles, tofu, green onion, a variety of mushrooms, carrots, cabbages, corn, and bok choy. If you go to an all-you-can-eat shabu shabu, the ingredients you can put inside the soup ranges even more! Shabu shabu is served with sauces, usually more than one kind. The thin-sliced meat is usually cooked within seconds once it’s dipped into the boiling soup, and together with the variety of sauces and vegetable, this dish makes for a perfectly hot, comforting meal on a cold day. Japanese rice cakes, or as known as “mochi” in Japanese, is written in Japanese Kanji as “餅” and in Hiragana as “もち”. 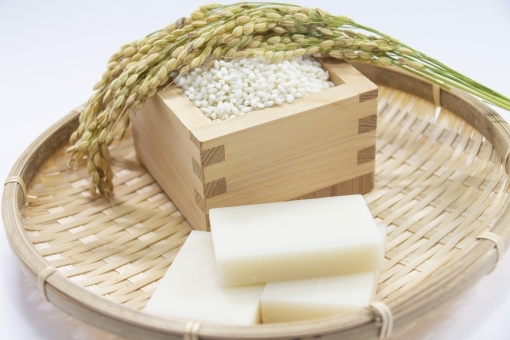 Mochi is made from Japanese glutinous rice. The traditional way of making mochi is by pounding the glutinous rice with a large wooden hammer-like pestle, in an “Usu”, written in Japanese Kanji as “臼” which is a wooden, or sometimes stone, mortar. People would use the pestle to pound onto the rice inside the mortar until the rice becomes a gooey paste. This method is call “mochitsuki” or “餅つき” in Japanese and is still a common practice in Japan. People, especially many foreigners, who have not seen the process of mochitsuki before usually gather around to watch as the huge wooden pestle pounds against the rice cake, and when the pestle goes up in the air to strike again, another person would quickly move the rice around for the rice cake to be pounded evenly. This process is both amazing and breathtaking since the person pounding the rice goes extremely fast and the person flipping the rice has to be quick enough to not get his/her hands smashed by the heavy pestle and seriously injure themselves. In the past, this chewy glutinous food was used as an offering to the gods, where it would then be cut and shared among citizens after the ceremony. Over time, it became a popular New Year’s celebration food and has become an important part of the festivities. 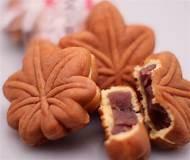 In modern day, however, mochi is enjoyed not only during festivals but also in everyday life. Over the years there are many different and creative ways to enjoy mochi, whether it be as a sweet dessert or with a hot soup. If you’re craving the sweeter side of mochi, the most popular and common sweet mochi is “Daifuku mochi”. Daifuku mochi, or “Daifuku” for short, is a small, round soft mochi with filling. Some fillings will depend on the season, as seasonal fruits are sometimes used as a stuffing. Fresh whole strawberries, for example, may be hard to find during certain seasons throughout the year, making strawberry Daifuku a challenge to find in stores when strawberries aren’t in season. The most common filing for Daifuku is red bean paste (“餡こ” in Japanese Kanji or “Anko” in English) and white bean paste (“白あん” in Japanese Kanji or “Shiroan” in English), where the shell is commonly white or light pink. 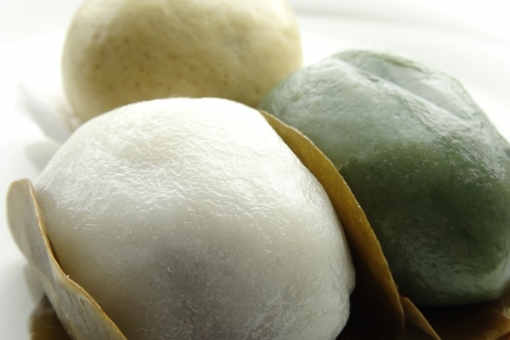 Green tea Daifuku, with red bean paste filling, is also common and can be found in most Japanese supermarkets. Aside from a sweet snack, mochi can also be enjoyed with other foods or completely on its own. Mochi can be added with Japanese Udon noodles, called “Chikara udon”. In Japanese kanji, the name is written as “力 うどん”, where “力” reads as “chikara”, and means “power” or “strength”. During winter, you can relish this mushy rice cake in hot Japanese noodles or freshly grilled on a stove. Either way, a warm mochi on a cold day is always a good idea! Japanese rice porridge is call “okayu” (お粥) in Japanese, which literally translates to “watery cooked rice” in English. If you usually have leftover rice and don’t feel too sure about what to eat with it, this is perfect for you. Japanese rice porridge can be made by adding rice and water, and the rice doesn’t even have to be fresh, so you can use any leftover rice you might have. Turning leftover rice into porridge is a good way to ensure that you just killed any bacteria that might be in the leftover rice, although if you’re that unsure, we might recommend that you throw it out. Most Japanese people enjoy okayu with pickled plum, or “umeboshi” (梅干し) in Japanese, with a dash of chopped scallion, or with red bean, which turns the rice into a slight cherry pink color. 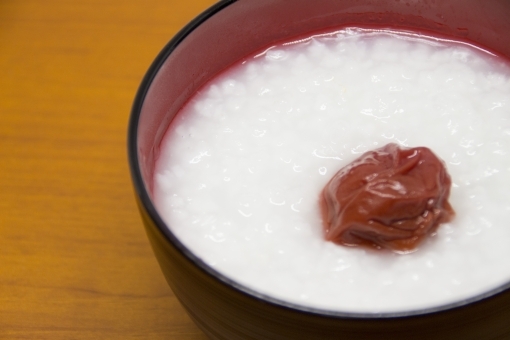 The sourness from the pickled plum goes hand in hand with the tender rice, and the slight sweetness from the red bean adds a very unique flavor to the porridge that you wouldn’t be able to taste in other parts of the world. To make the dish fancier, some people like to add eggs, seaweed, mushrooms, pumpkins, and other side ingredients to add extra nutrients and make the dish even tastier. In Japan, okayu is the go-to dish for when you are sick since the soft rice is easy to swallow and the hot soup can help with sore throats and cold. A bowl of hot Japanese rice porridge can definitely help warm you up on a freezing night. Ramen, Japanese noodles, is undoubtedly one of Japan’s most famous dishes. People from all over the world come to Japan just to try an authentic version of this tasty bowl of noodles. 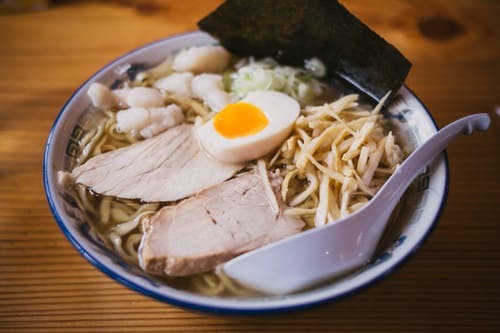 Ramen is made with a pale-yellow wheat noodle and broth made of meat or fish, and is commonly seasoned with miso, and topped with sliced grilled pork, finely chopped scallion, and a half-boiled egg. A slice of seaweed and pickled bamboo shoots are also common toppings for ramen. 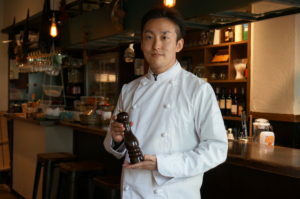 Each restaurant has their own special take on ramen, with secret broth recipes unique to each shop. 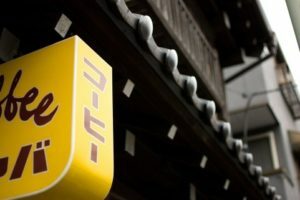 Nonetheless, with a huge variety of ramen restaurants in Japan to choose from, it may be hard for foreigners to know which ramen restaurants are the best. 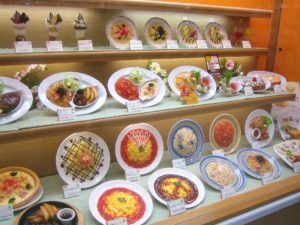 So if you are unsure as to which restaurant to choose from, you may want to visit the Shin-Yokohama Ramen Museum located in Yokohama. 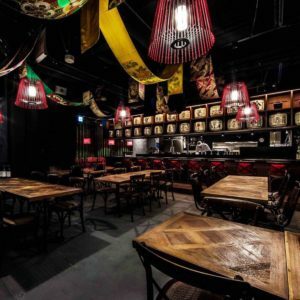 The museum gathers the best ramen restaurants in Japan into one area, allowing you to taste and try a diverse range of ramen from all over Japan. They also have vegetarian ramen, non-pork ramen, and ramen with gyoza. With different varieties of noodles, from thin to thick, to even wrinkled noodles, Shin-Yokohama Ramen Museum is the go-to destination for those who enjoy the savory taste of ramen. You can find out more about the museum here. 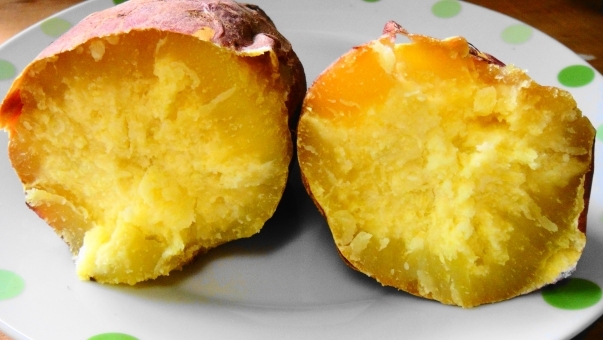 Roasted sweet potato is called “Yaki-imo” in Japanese, and is written in Japanese kanji as “焼き芋”, with “焼き” pronounced as “yaki” which means “bake”, and “芋” pronounced as “imo” which means “potato”. Although this dish sounds incredibly simple, it is still one of the best foods to enjoy during the cold winter months. In Japan, whether it’s in the supermarket or on the sidewalk, you can see these steaming sweet potatoes being sold on a food stand or vendor, on top of dark grey rocks. These rocks are used as a special way to roast the sweet potatoes, where the sweet potatoes are placed inside a pile of heated rocks until it gets cooked. This method is called “ishiyaki-imo” (石焼き芋), where the word “ishi” (石) means rocks. This method is, however, only one of the many ways roasted sweet potatoes are being prepared in Japan. In autumn, when a large quantity of leaves falls from the trees, yaki-imo can be made through roasting sweet potatoes under a pile of leaves. The most simple way to make yaki-imo, however, is undeniably by using the microwave. Whether you prefer buying or roasting the sweet potatoes yourself, the warm yaki-imo is a Japanese dish that you should not miss this winter. The light smoke sears out of the purple-skinned sweet potato as you cut them into half, combined with the light burnt smell from the roasting makes the hot yaki-imo a dish that will keep both your hands and stomach warm this winter. Will You Try Any of These Warm Japanese Food this Winter? 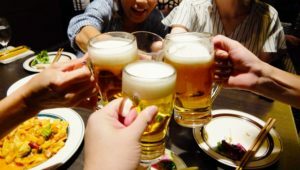 Winter in Japan can be unbearably cold, and an empty stomach will definitely make things worst. 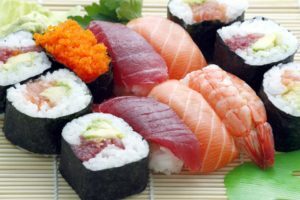 Fortunately, Japan has a lot of amazingly delicious foods that are perfect for winter and can help you fight against the chilling climate. Whether you enjoy the coziness from snuggling inside a blanket in your room, or going outside and enjoying the winter festivities, there is always a warm Japanese dish that you will be able to enjoy. Now that you know what some of Japan’s winter foods are, don’t forget to try them and keep your body warm and stomach full this winter!